Two-time Olympic Champion Edwin Moses has told CNN that "sport has had its head in the ground" over the issue of hypoandrogenism. US athletics great Ed Moses says sport has had its "head in the ground" over the issue of hypoandrogenism and called for South African Caster Semenya to be treated fairly as her appeal against testosterone restrictions in female runners takes place in Switzerland. Semenya, the double Olympic 800m champion, is hyperandrogenous, meaning she has elevated testosterone levels, a condition that has dogged her athletics career ever since she won the world 800m title as an 18-year-old in 2009. She is seeking to overturn a regulation proposed by athletics' governing body -- the International Association of Athletics Federations (IAAF) -- to restrict the levels of testosterone in female athletes. "There's some medical issues, social issues and sports issues that all combine and it's really hard to determine what is the right path to go," Moses, the two-time Olympic champion, told CNN's Alex Thomas at the Laureus World Sports Awards in Monaco. "The most important thing is fairness to the athletes. 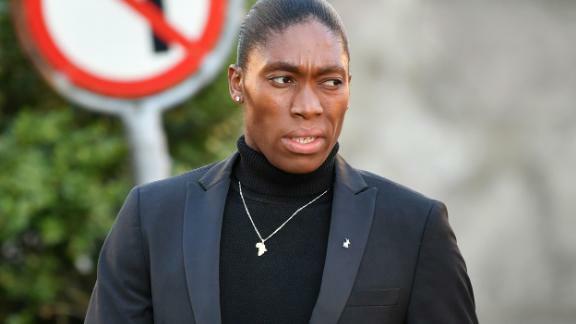 "I've spoken to a few women who were distance runners and they gave me a point of view that I was surprised at and that was mainly fairness to Caster before everything else and that she not be castigated because of her situation, which she has nothing to do with. They were interested in her as an individual, so that was heartening to me." The latest proposed IAAF regulations aim to cover events from 400 meters up to one mile. They were due to come into effect in November last year before being delayed by Semenya's challenge, which began at the Court of Arbitration for Sport in Lausanne Monday. Athletes categorized as having a Difference of Sexual Development (DSD) will have to reduce their blood testosterone level for a continuous period of at least six months and must maintain those levels continuously for the rest of their athletic career. "The sporting side has had its head in the ground for quite a few years," said former 400m hurdler Moses of hypoandrogenism. "You have to understand the signs before you can move to the sports issue and let alone the social aspects of it." The case will be heard until Friday, with a verdict expected by March 29. In a statement released Monday, the IAAF said it was seeking to ensure that "athletes who identify as female but have testes, and testosterone levels in the male range, at least drop their testosterone levels into the female range in order to compete at the elite level in the female classification." It added: "This standard is necessary to ensure fair competition for all women. Indeed, without it, we risk losing the next generation of female athletes, since they will see no path to success in our sport." The IAAF has previously said that it is not seeking to classify any DSD athletes as male, according to the AFP News agency. Before the hearing, Semenya's lawyers and Athletics South Africa (ASA) accused the IAAF of breaching confidentiality regulations by releasing a list of five expert witnesses who will testify on its behalf. Semenya has strong backing from her home nation and athletics federation. Athletics South Africa said last week that the country has a "constitutional obligation to contest any infringements of human rights, as shaped by our experiences under apartheid." That position was backed up by South Africa's minister for sport and recreation, Tokozile Xasa, who stated that what was at stake was about far more than just sport. "Women's bodies, their well being, their ability to earn a livelihood, their very identity, their privacy and sense of safety and belonging in the world, are being questioned. This is a gross violation of internationally accepted standards of human rights law," Xasa said. Xasa said it seemed like the Olympic champion was being targeted by the IAAF as the only events covered by its new rules appeared to be ones Semenya competed in. Semenya burst onto the scene at the 2009 world championships in Berlin where she won a first major gold, but she was unable to compete for much of 2009 and 2010 after undergoing gender verification tests, the results of which were never officially released. The South African was eventually cleared to compete again but a new rule which enforced testosterone limits was introduced in 2011. Yet that directive was subsequently overturned by CAS in 2015. Semenya went on to win Olympic gold in Rio de Janeiro in 2016 -- adding to a gold medal belatedly picked up in London four years earlier after her silver was upgraded because of a doping violation by the winner, Mariya Savinova of Russia. British athlete Lynsey Sharp was reduced to tears after watching Semenya storm away to victory in Rio. Sharp stated at the time that it was "difficult" for others like her to compete. Don't trust the polls? You should. They've been fairly accurate so far this election cycle.